On May 25, 1977, a director named George Lucas gave the world its first glimpse of a galaxy far, far away. 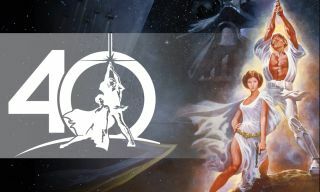 Who knew that a space opera about a farm boy who befriends a wizard and a smuggler pirate, frees a princess and liberates a galaxy would spawn a multibillion-dollar franchise and cultural touchstone? Not 20th Century Fox, and certainly not Lucas, who was convinced it would flop. "Star Wars" would end up making $1.5 million on its opening weekend and more than $220 million during its first run — a veritable fortune at the time. Forty years and eight films later, Lucas' depiction of the battle between good and evil remains as relevant today as it was then. Here are 40 surprising facts about the movie that started it all. John Williams, the Oscar-winning composer who scored the music for almost every "Star Wars" movie (excluding "The Clone Wars" and "Rogue One"), told the Mirror he has never sat all the way through any of the "Star Wars" movies. While playing Chewbacca, Peter Mayhew spoke his lines in English. The dialogue was later dubbed into Wookie — a combination of bear, walrus, lion and badger sounds — during postproduction. Because Carrie Fisher (Princess Leia Organa) was a foot shorter than Ford, she had to stand on a box for most of their scenes together. Lucas' Alaskan malamute inspired the character of Chewbacca. "A very sweet dog, she would always sit next to me when I was writing," he said. "And when I'd drive around, she'd sit in the front seat. A malamute is a very large dog — like a 130 pounds and bigger than a human being, and very long-haired." When Lucas visited Steven Spielberg on the set of "Close Encounters of the Third Kind," he was convinced his friend's movie would eclipse his own. "George came back from 'Star Wars' a nervous wreck," Spielberg recounted. "He didn't feel 'Star Wars' came up to the vision he initially had. He felt he had just made this little kids' movie." Lucas proposed a trade: 2.5 percent of the profits from "Star Wars" in exchange for 2.5 percent of "Close Encounters." Spielberg took the gamble, and receives royalties from the film to this day. Harrison Ford, who played Han Solo, wasn't a fan of Lucas' script. In fact, he once groused to the director "George, you can type this s---, but you can't say it!" In Lucas's original treatment, R2-D2 could speak. A 1974 draft of the movie gave him such lines as, "The structure has exceeded the normal stress quotient by point four, although there appears to be no immediate danger." While filming the trash compactor scene, Mark Hamill (Luke Skywalker) held his breath so long he popped a blood vessel. As a result, many of the shots show only one side of his face. Fisher and Ford had an "intense" three-month affair while filming "Star Wars: A New Hope," according to Fisher. Ford was a married father of two at the time. In a letter to a friend, Alec Guinness, who played Obi-Wan Kenobi, dismissed "Star Wars" as "fairy-tale rubbish." He also later claimed it was his idea to have his character killed off so he "wouldn't have to carry on saying these rubbish lines."